From the Hancock County Courthouse, go east on Broad St. for two blocks. Turn right on Boland St., which becomes Linton Rd, and go 12.8 miles, through Linton and to Thompson Road. Turn right and travel 0.6 mile. If accessed from Thompson Rd, the cemetery is 200 yards from the right side of Thompson Rd; otherwise, turn right on private drive and go 0.1 mile to the house. The cemetery will be 150 feet to the right of the drive and house. d/o R. L. and Lizzie Thompson. We can safely leave our boy, Our darling in Thy trust. "Mother, thou are now at home, 'Mong Angels far above, But yet below thy children must roam, Till summon'd by his love." w/o Charles Thompson. J.J. is James Julian & C.K. is Climmie Kate, per Mary Thompson. "A little time on earth he spent, till God for him His angel sent." d/o James Julian and Climmie Kate Jackson Thompson. Age 3 years. 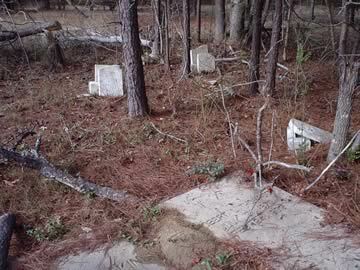 Believed to be somewhere in this cemetery, per Mary Thompson.